1&1 is a leader amongst global web hosting providers, offering innovative web products at competitive prices. 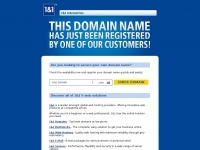 © 2013 1&1 Internet Inc is the owner of the copyright for this website. The web server with the IP-address 74.208.129.200 used by Citv.us is owned by 1&1 Internet and is located in Wayne, USA. The website Citv.us has a own web server. The web server only runs this website. The websites of Citv.us are served by a Apache server. The markup language of the website is HTML 4.0 Transitional. The website does not specify details about the inclusion of its content in search engines. For this reason the content will be included by search engines. The homepage of the website is "/defaultsite".